Heads bob in and out of view as a half-dozen bodies ride the swell 100 metres (330 feet) offshore. They’re straddling surfboards, looking out to open water, watching, waiting. At my feet, spent waves peter out on the beach before they slide back into foam. As far as surf scenes go, it’s pretty typical. Except that I’m at Bluffer’s Park in Toronto, and it’s the middle of February. 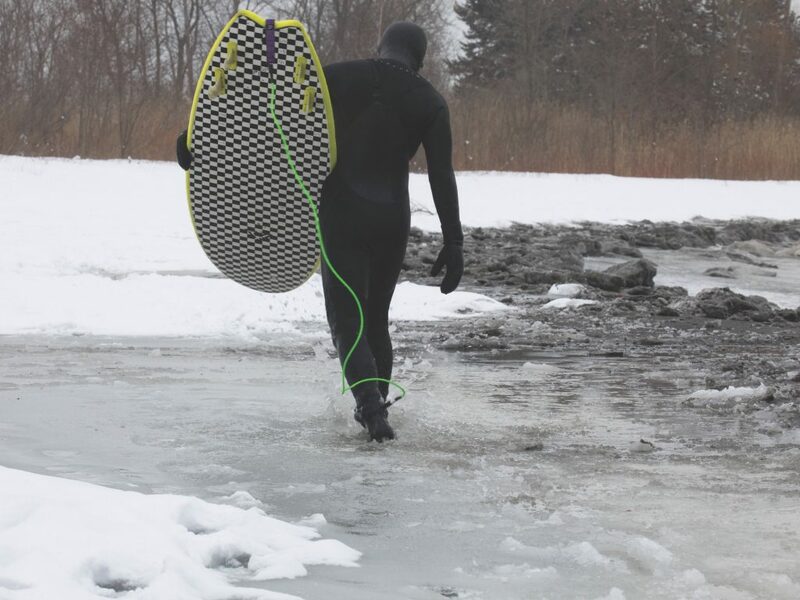 With hands made clumsy by thick neo-prene mitts, I tuck my bangs under the hood of my wetsuit, pick up my board and step over a broken crust of beach ice and into the frigid water of Lake Ontario. Like most warm-blooded people, I’m intrigued by surfing: the beauty of the building wave, the violence of its inevitable collapse. Those tanned souls who cut a thin line within that instant between build and collapse — I want to be one. But I live deep inside the North American continent. No problem, says Antonio Lennert. In 2017, he opened up Surf the Greats, his shop in Toronto’s Leslieville, and he now has a full schedule of lessons, surf forecasting clinics, guided sessions and gear swaps — anything that might get more people out on the water and, in his oft-repeated phrase, build the community. His plan seems to be working. Fast-forward six months to a blustery evening in September, and Lennert is throwing a launch party for his new 2,000-square-foot dedicated surf shop. Sixty guests — including local aces Larry Cavero and Alex Boutilier — crowd around the boards, clothing and other gear or elbow up to the bar for piña coladas. Others peer through the window of the shaping booth, where a guy is shaving layers off what will be the foam core of someone’s custom board. It all looks enticing to this wannabe soul surfer. Still, I’m not quite convinced that at 44 I need a new hobby that involves getting tossed around on an almost-frozen lake. Scanning the room for someone who looks about my age, I find Andrea Hardcastle. I ask her how realistic this pursuit is for ordinary people. “I get out five or six times a month,” she says, assuring me that the winter weather only fuels her Great Lakes passion. Through a faint accent from his native Brazil, Lennert explains, patiently but passionately, that she shouldn’t be blown away, because the Great Lakes offer a lifetime’s worth of rideable breaks. If you want to surf, you can do it here. After all, the lakes have an accumulated coastline three times longer than California’s. And they have something else traditional destinations don’t: a non-competitive, inclusive vibe. 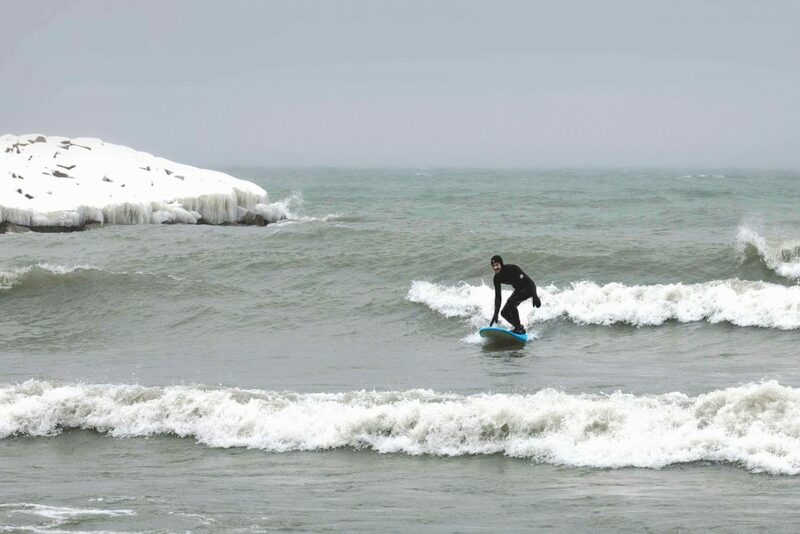 Despite the cities that crowd the shores, surf spots on the Great Lakes have ample room to breathe. Maybe that’s because most of the action happens in the winter. There’s an explanation for why fall and winter bring the best waves, but back on that frozen-fast beach the only meteorological input on my mind is temperature. Water seeps into my wetsuit as I make my way into the lake, braced against the breaking waves. 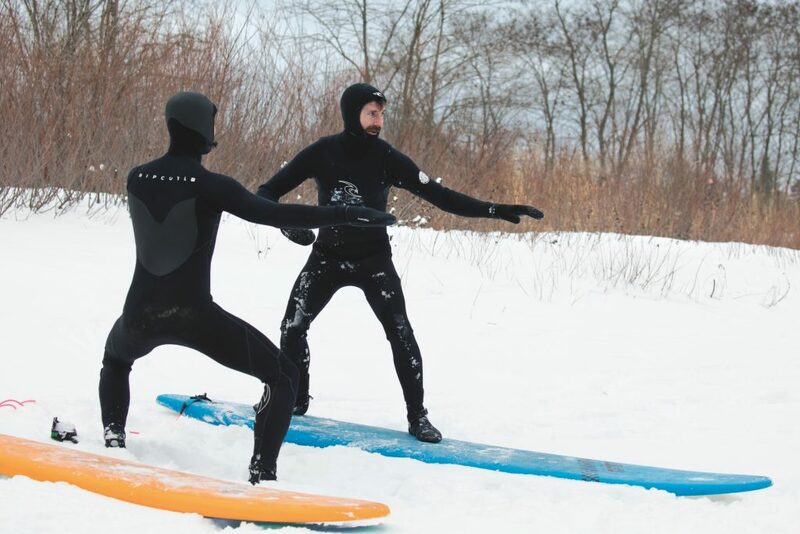 When I reach waist deep, I slide onto my 2.5-metre (eight-foot) board and start paddling behind Lennert. He leads me through the surf zone and out to the takeoff point, that place where rolling waves slow, steepen, crest and become rideable. Read more about winter surfing in re:porter Issue 69, on flights now. Get outside and skate away the winter blues at these Toronto rinks. © 2017 Porter Airlines Inc.